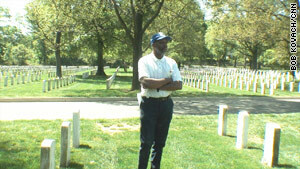 Interment foreman Darrell Stafford has worked at Arlington National Cemetery for nearly 28 years. Washington (CNN) -- The eyes of the nation turn to Arlington National Cemetery each Memorial Day weekend. Here, among the familiar iconic white granite markers, privates lie side-by-side with generals. For a nation at war, these lines grow longer every day. The cemetery's intention, of course, is to honor those who made the ultimate sacrifice. But the business here is to bury the nation's war dead. Darrell Stafford's title is interment foreman. In the execution of their duties, his teams perform a choreographed ballet of precision and organization. Memorial Day weekend is one of the busiest times of the year at Arlington. "We want to be prepared and want people to come out and have a good visit," said Stafford, wearing a crisp white polo shirt, blue work pants and baseball cap with a patch that says "Arlington National." "We want to make sure everything we have is always up to par -- most of the time it is -- but we really want to make sure it's at its best at those times." Stafford arrives for work at the cemetery before 8 a.m. -- before the security guards have unlocked and swung open the huge gates, before the flood of tourists make their walk from the Metro subway station up the hill to view the Kennedy graves or the changing of the guard at the Tomb of the Unknowns. There is work to be done and a schedule to be kept. Stafford has called Arlington National his work address for nearly 28 years. His crews prepare the graves for each day's military burial services. He drives from section to section in a black pickup truck, checking on his teams along roads that are named Eisenhower, Patton, Bradley and MacArthur. "Typically, it's a rush. I'm doing 15 to 25 funerals a day," Stafford said. "It's almost three or four an hour, and it goes pretty quick." Everybody's a VIP who enters Arlington National Cemetery, whether it's a private or a general. A day before each burial, a team of workers digs each grave and installs a concrete grave liner. On the day of each service, the team lays planks around the grave and puts in artificial grass and a lowering device. Chairs are arranged in a row for family members who will attend the burial service. When they get an all-clear and the family has said goodbye and paid their final respects, his team moves in again. Team members remove the setup items, lower the casket and cover the grave. These duties are done almost invisibly -- the team blends into the scenery, but its work is woven from grave site to grave site for family after family. Most of the time, they perform a thankless task. But sometimes, their work is recognized by people attending the services. "We have folks coming, from time to time, showing their appreciation and thanking us and just walking up to you and shaking your hand. It's a good feeling." For most visitors, much of the cemetery looks the same. But for Stafford, each section is distinctive, including Section 60, which he holds apart from Arlington National's other areas because it holds fallen troops from the wars in Iraq and Afghanistan. "I'm kind of connected to Section 60 more, I guess, because it's the young people [attending services]. Normally, it's elderly people or middle-aged people and grandchildren, but in Section 60 it's different. It's high school kids or college kids, hundreds of them attending funerals because somebody's lost their life who may be 22 or 23 years old. It has more of an impact on me," Stafford said. Stafford has seen a lot of history in his years working at Arlington. He has seen dignitaries and heads of state and every sitting U.S. president for the past two decades come and pay their respects. But one historic day stands out from all the others. He said that "9/11 was quite a day. I saw the plane approach the Pentagon, coming over the Naval Annex. We were kind of mesmerized by it, but we knew we wanted to get out of the way. I and one guy ran toward the plane as it went toward the Pentagon, and we actually went under the wing of it as it passed over. In a matter of seconds, we ducked for cover. I peeked over my shoulder, and moments later, I saw the big old ball of fire and heard the explosion, and it was unreal. It was like somebody turned on a gigantic heat lamp on the back of your neck." Usually, when Stafford and his team prepare the grounds for burial, it is for someone who has died in a faraway place. This time, it was close to home. "You hear about stuff ... on the news ... and you see the plane going into the building, and a month later or a couple of weeks later, you bury some of the same people," he said. In the rear of the cemetery, near the Fort Myer gate, stands Section One, which is among the oldest parts of this hallowed ground. Military figures who rest here are honored with enormous carved gravestones, towering obelisks and even cannon. In other sections, you see row after row after row of white standard-issue granite markers. But Stafford says rank has no place when it comes to his team and how they treat the fallen. "Everybody's a VIP who enters Arlington National Cemetery, whether it's a private or a general," he said. "We look at them the same. Someone's loved one has passed on, and we should do our best to make their departure or the last moments with their loved one the best we can give them." Stafford and his team take a lot of pride in their work and get a great deal of satisfaction from the duty they perform. "If you didn't care you wouldn't be here," he said earnestly. "I wouldn't be here this long if I didn't care -- if it didn't matter."